Tritech Group is a Romanian producer of high efficiency polycrystalline photovoltaic panels. In 2015, the company invested in the construction of a modern factory. Located in Ovidiu City, Constanta Country, the factory provides the strategic advantage to be situated close to the A4 highway and the Constanta harbour. The factory is equipped with professional production machinery, that ensures the highest quality of the produced solar panels. The acquisition and use of cutting-edge production machinery is, for our clients, the best warranty that we offer high efficiency photovoltaic panels. In the production process we use an ultra modern production line and ISO 9001:2008 and TUV InterCert Saar certified raw materials, in order to obtain high performances. Tritech Group is photovoltaic panels producer holding a control and warranty technology of the products offered to our clients. Because we are focused on the high quality and long cycle life of our products, we decided to execute tests both of raw materials and of the manufactured photovoltaic panels. The testing is performed continuously, both visually and using some complex testing systems. The quality control is executed by trained responsible quality control people. The quality control executed rigorously throughout the all technological flow ensures that the manufactured photovoltaic panels meet the highest quality standards. 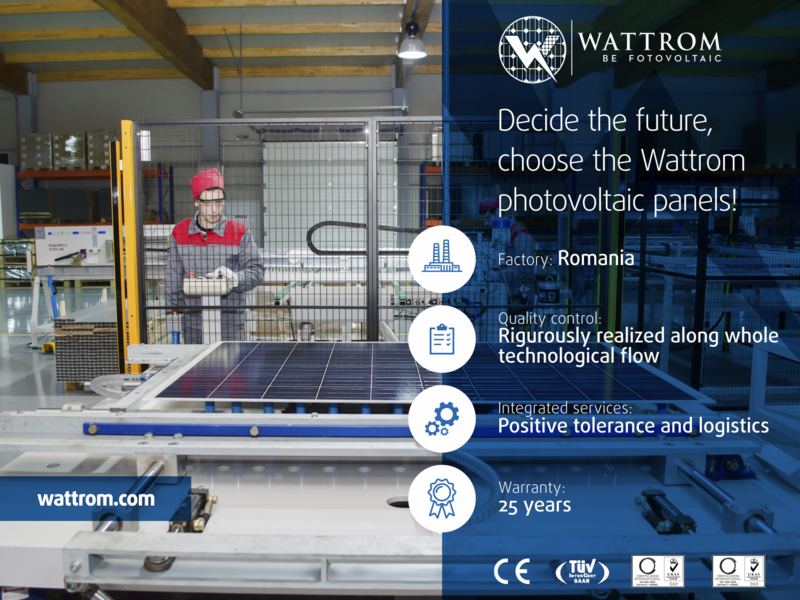 The manufactured photovoltaic panels are registered and marketed under the WATTROM brand. The Wattrom photovoltaic panels are CE marked. In every step of production process, Tritech Group verifies the quality of manufactured WATTROM photovoltaic panels. Testing efficiency is a different step with high importance. We test efficiency of every WATTROM solar panels with a complex and modern system. The complex machinery offers synthetized information about tested solar panels. The resulted dates are recorded in our database. A sticker is automatically generated, printed with the results generated from testing. The sticker confirms the performance of each manufactured solar module, being easily read and understood by everyone. Depending on our clients' requests, we can deliver polycrystalline photovoltaic panels of different sizes and yields. Also, we offer competitive prices on the intern market, but also on the foreign market. Tritech Group is a reliable and flexible partner, able to satisfy its clients' most demanding needs. WT 250P16 was Wattrom best seller in 2015. WT 250P16 is characterized as a robust solar panels with meticulous design. WT 250P16 can be used for on/off grid applications. 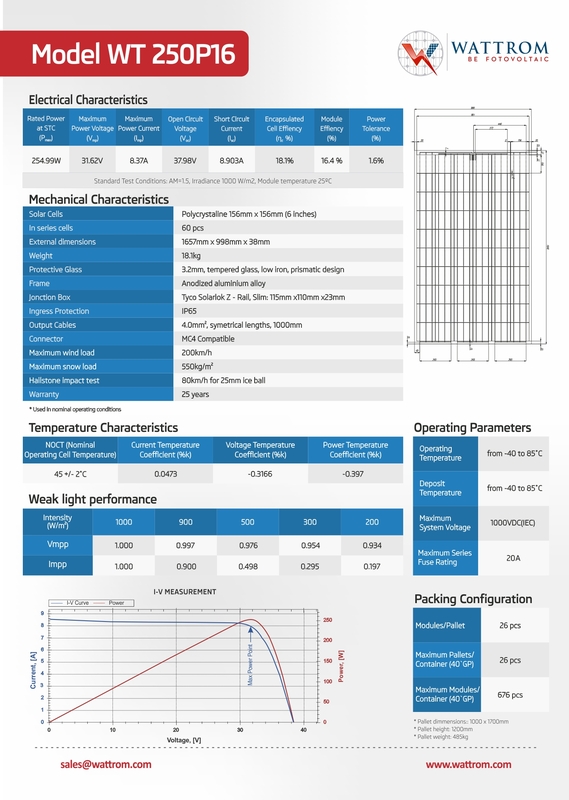 WT 250P16 is distinguished by high efficiency of up to 16,4% and output power tolerance 1,6%. We offer customized solutions for packing and transportation. We deliver any quantity of solar panels. We don't have a minimum ordered quantity.